Paris is an exceptional city who benefits from a great reputation among bloggers and lovers alike. Although just like every capital in the world it is not perfect and has flaws, the City of Lights gives off an irresistible something that makes you fall in love with it. Maybe it's part of my French pride to rave about Paris but it didn't take me long to realise I am just one in a million: until recently, it had been the most visited city in the world. The evidence being that flocking together under the Eiffel Tower has lost a little bit of its splendor, but anyway. What happened in November 2015 impeded people to live normally at first but as nothing stands for freedom more than Paris, the city has found a way to continue doing what it does best: drinking wine at a terrace, talking for hours with a coffee in hand and loving, of course. I had the chance to spend a few days there at friends' in mid-October, when autumn was slowly settling in. I took the time to observe the Haussmannian architecture, its perfectly aligned balconies and blue rooftops, and realised how much I wanted to be on the other side in spite of the distressing amount of Parisian rents. Honestly, what other city in the world could make you envisage the possibility of living in a tiny space just to be part of it? I think the answer is simply because it makes you dream. It's not even a cliché depending on what makes you happy. Obviously the cost of living is high and sometimes Paris is hardly a bed of roses: grey, rainy, full of people in a hurry or suffering hardship. But if you're part of the people who are irresistibly attracted by the city, you also know the tremendous amount of culture, laughter, moments of languorous laziness in bed, French and foreign cuisine, breakfasts and views that it has to offer which are just yours to grasp. It's no coincidence if Paris has been luring artists, workers and lovers from all over the world for centuries and continues to do so despite other rising spots in Europe and other continents. The French lifestyle never seems to be obsolete, standing the test of time. An cliched image of the Parisienne was even created: can we say so for other women in Europe? Do we have a cliché for the Berliner, the Londoner, for the Spanish girl? By chance, there was a signing session at the Hôtel Hoxton by Jeanne Damas, a Parisienne whom I really like. Together with Lauren Bastide, they wrote an entire book (called à Paris) that display the stories of many Parisian women and their love for their city and arrondissement, and deconstructs the fake image we can have of the Parisian (many of whom actually come from other areas of France). 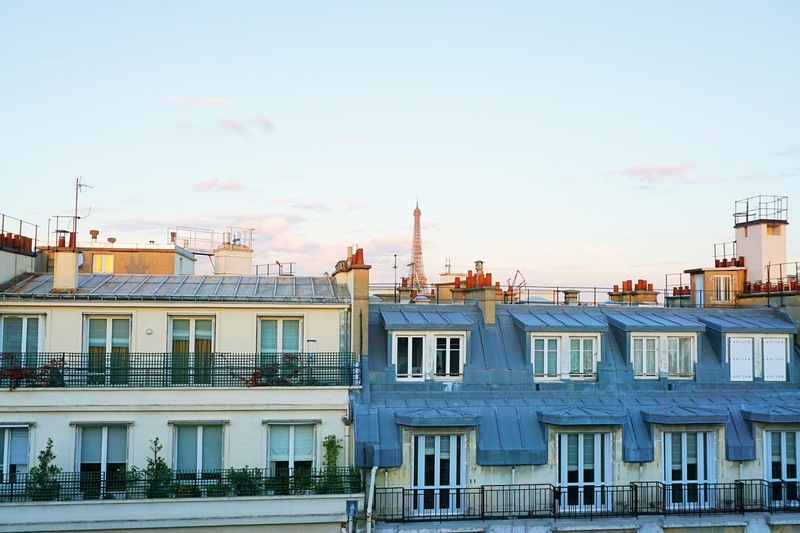 I found out that if this cliché obviously doesn't exist, a Parisian lifestyle remains. To read if you want to discover a more truthful portrait of what it is to live in Paris! I can definitely tell that at one point I'll be spending some time there. What about you, have you ever visited or lived in Paris? Can you sense the fascination around it? Okay first off that is an incredible photo of Paris. I've only ever visited Paris for short stays at a time but I do think it would be an amazing experience to live or work there for a while. I just love Paris and have been there 4 times, I think. I wish I could go back right now! Awesome post btw!